The tools for architecture and engineering are developing rapidly and the cooperation between architects and engineers becomes integrated. 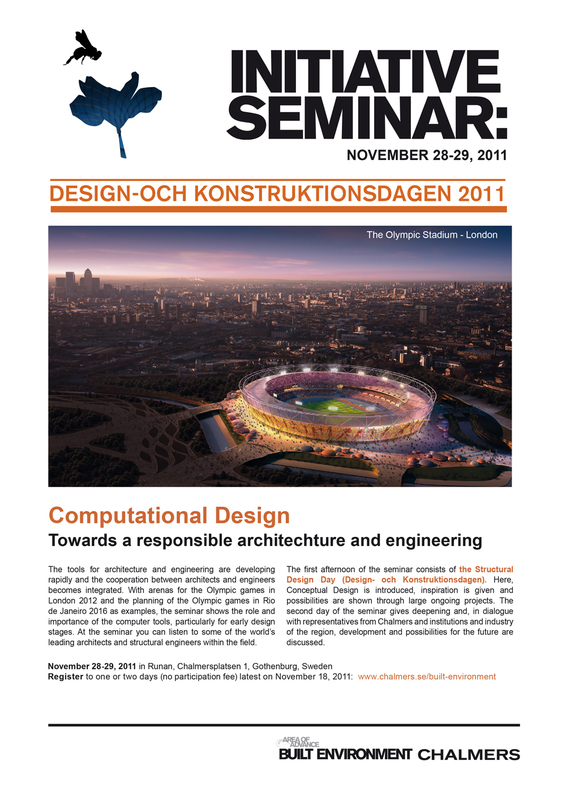 With arenas for the Olympic games in London 2012 and the planning of the Olympic games in Rio de Janeiro 2016 as examples, the seminar shows the role and importance of the computer tools, particularly for early design stages. At the seminar you can listen to some of the world’s leading architects and structural engineers within the field. The first afternoon of the seminar consists of the Structural Design Day (Design- och Konstruktionsdagen). Here, Conceptual Design is introduced, inspiration is given and possibilities are shown through large ongoing projects. The second day of the seminar gives deepening and, in dialogue with representatives from Chalmers and institutions and industry of the region, development and possibilities for the future are discussed.